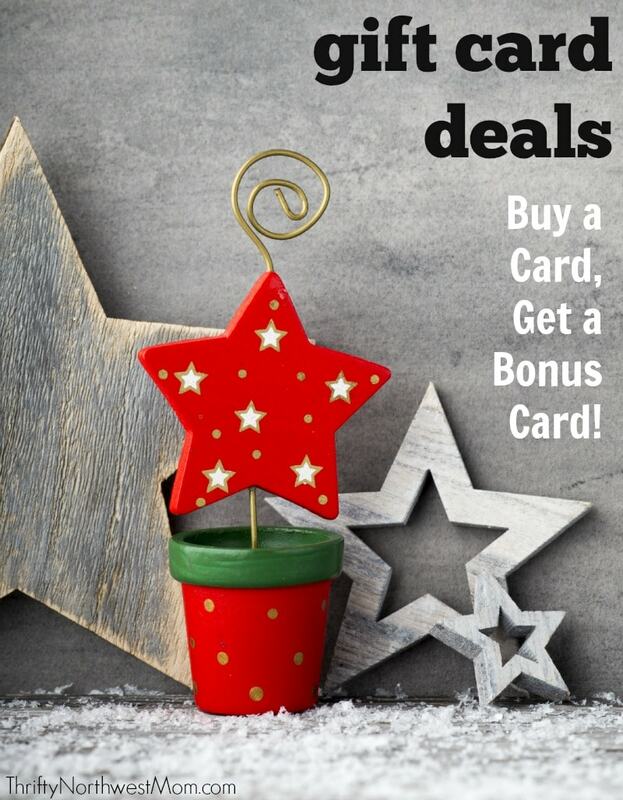 Gift Card Bonus Deals Roundup – Northwest & National Restaurants & Retail Stores! One way to stretch your savings at stores is by taking advantage of special bonus deals for gift cards that come around during the holidays. This is a great strategy for those stores where it’s hard to find sales or specific items that are on your Christmas list or just a much-needed item that never go on sale. Or maybe the latest technology device that came out that won’t be on sale for quite some time! All it takes is a little strategizing to figure out how to maximize these gift cards to your advantage throughout the year. These bonus gift cards are also a great way to save on dining out. If you have a particular restaurant (or several restaurants) that you enjoy going to during the year, then buy those gift cards ahead so you can receive the bonus coupon or gift card. If you have coupons to use at the restaurant later, that will also give you additional savings on top of the gift card savings. Just make sure to read the fine print on the offers first, as there may be certain restrictions of when you have to use the gift cards (they may have only a limited amount of time to use the gift cards). Restaurant Bonus Gift Card Offers 2018! Applebee’s: receive a $10 bonus card when you buy $50 gift cards thru 1/6/18. Bonus card expires 3/3/19. Benihana: receive $10 bonus card when you buy $50 gift cards. Promotional cards are valid from 1/2 – 3/31/19. BJ’s Restaurants: receive a $10 bonus card when you buy $50 gift cards or $25 bonus with $100 purchase. Also receive a 20% off VIP card delivered via email. Bonus card and VIP card valid 1/1/18 – 2/13/19. Black Angus: receive $10 bonus gift card when you buy $50 in gift cards. Bonefish Grill: receive $10 bonus gift card when you buy $50 in gift cards. Bonus card redeemable 1/1-2/10/19. California Pizza Kitchen: receive a $20 rewards card when you buy $100 worth of gift cards until 1/1/19. Bonus card redeemable 1/7-2/24/19. Carrabba’s: receive $10 bonus gift card when you buy $50 in gift cards. Bonus card redeemable 1/1-2/11/18. Cheesecake Factory: For every $25 in The Cheesecake Factory gift cards or eGift you purchase online you will receive one complimentary slice of cheesecake or layer cake. Slice of Joy card redeemable on a future visit from 1/1/2019 – 3/31/2019 for one complimentary slice of cheesecake or layer cake. Chili’s: receive a $10 bonus card when you buy $50 worth of gift cards. Bonus card is valid 1/2- 2/6/19. Claim Jumper: receive a $10 bonus card when you purchase $50 in gift cards thru 12/24. Bonus card is valid 1/2-5/31/19. Denny’s: receive $50 in Denny’s coupon for every $25 Gift Card purchase. Promotion ends 12/25/18. Famous Dave’s: receive $5 Rewards Card when you buy $25 in gift cards. Participating locations only. Fogo de Chão Brazilian Steakhouse– receive a $25 Holiday Bonus Card for every $150 in gift card purchases. Available 10/31-12/31/18, Online or in Restaurants. Redeemable 1/2- 3/31/19. Gift Cards may not be redeemed on the day of purchase. LongHorn Steakhouse: Receive $5 bonus gift cars when you buy $25 in gift cards online. Bonus card is valid 1/1 – 2/3/19. Maggianos: receive a $20 promotional Bonus Card for every $100 in gift cards. Menchie’s: receive a $5 bonus card for every $25 you buy in gift cards. Bonus cards are valid until 6/30/18! Morton’s: receive a $50 bonus card when you purchase $250 in gift cards thru 12/24. Bonus card is valid 1/2-5/31/19. Olive Garden: Receive $10 off bonus coupon when you buy $50 in gift cards. Bonus card is valid 1/1 – 2/10/19. Outback Steakhouse: receive $10 bonus gift card when you buy $50 in gift cards. Bonus card redeemable 1/1-2/10/19. Panera: receive $10.00 bonus card for every $50 in Panera Bread plastic gift cards and eGift cards purchased or reloaded in-cafe or online between 11/14/18–12/31/18. P.F. Chang’s: receive a $20 bonus card for every $100 you spend on gift cards online. Bonus card valid 1/01/2016 – 3/31/2019. Red Lobster: receive $10 off bonus coupon when you buy $50 in gift cards online. Bonus coupon is valid 1/2/18 – 2/5/19. Red Robin: receive a $5 Bonus Buck Rewards card with every $25 gift card you buy. Bonus Bucks valid 1/1 -2/28/2019. Ruth’s Chris: receive 10% Bonus Card when you buy $250 or more in gift cards. Holiday bonus cards valid 1/1 through 3/31/19. Tony Roma’s: receive $15 in RomaBucks For every $50 in Tony Roma’s Gift Cards you purchase. RomaBucks are valid 1/1 – 3/22/19. Retail Gift Card Offers 2019! Barnes & Noble: Get a free $10 Reward, valid from 12/26/17 to 2/28/19, with any Gift Card purchase of $75+ or more. The Children’s Place: receive a $10 off coupon when you buy $40 in Gift Cards thru 12/24. DSW: receive a $5 bonus gift card and free box when you buy $50 in gift cards, or $20 when you spend $100. Bonus card is valid between 1/5-1/27/18. Half Price Books: receive a $5 bonus gift card when you buy $25 in gift cards. Gift cards must be purchased by 12/24/18, bonus gift card valid 1/1-1/31/19. Kroger: 4x the fuel points with gift card purchases promotions and individual digital coupons for select gift cards. L. L. Bean: receive a $10 gift card with a $50 purchase by 12/24/18. Plus Free shipping with $50 purchase. Red robin has $5 bonus when you buy a $25 gift card and Burgerville has $5 bonus with $30 gift card purchase. Arby’s is a free combo meal with a $20 gift card, and Taco Bell has a free Chicken flatbread combo with $20 gift card. Awesome – thanks for the tips! Target has $50 iTunes cards for $45 this week.